Wide range of goniometers facilitate quick and easy measurement in any setting. Convenient for use in a range of diagnostic and progress-tracking applications. Durable to ensure long life and repeated use. The Baseline Metal Goniometers are designed to assist physical therapists and medical professionals in the assessment of a patient's baseline ROM abilities, as well as aid in determining and modifying the patient’s ongoing therapy plan. This diverse selection of goniometers includes a wide range of models to easily facilitate measurement of most bodily joints in a wide variety of applications. Each goniometer is constructed with high-quality stainless steel to ensure longevity and reliable measurements through every use. 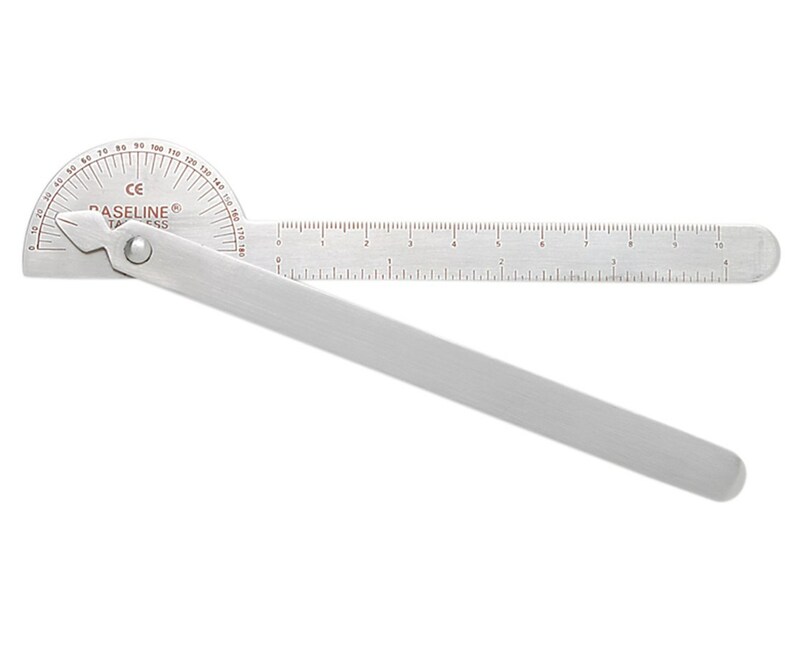 The linear scale on the metal goniometer arms measures in inches and centimeters while tension between the arms is controlled by the thumb knob. Baseline Metal Goniometer-180 Degree Range - 6 inch Legs - Robinson. Has a 180° head marked in 5° increments. Baseline Metal Goniometer-180 Degree Range - 8 inch Legs. Has a 180° head is marked in 1° increments. Baseline Metal Goniometer-180 Degree Range - 14 inch Legs - Conzett. Baseline Metal Goniometer-180 Degree Range - 18 inch Legs. Baseline Metal Goniometer-360 Degree Range - 14 inch Legs. Has a 360° head is marked in 1° increments. This set of 6 Baseline goniometers comes packaged in a strong carrying case with a foam padded interior that keeps your goniometers securely positioned for safety as well as easy storage and transport for use whenever you need them. Baseline Metal Goniometer-180 Degree Range - 6 inch Legs - Robinson. (FEI12-1042). Baseline Metal Goniometer-180 Degree Range - 8 inch Legs.(FEI12-1040). Baseline Conzett Metal Goniometer - 180 Degree Range - 14 inch Legs (FEI12-1041). Baseline Metal Goniometer - 360 Degree Range - 14 inch Legs (FEI12-1050). 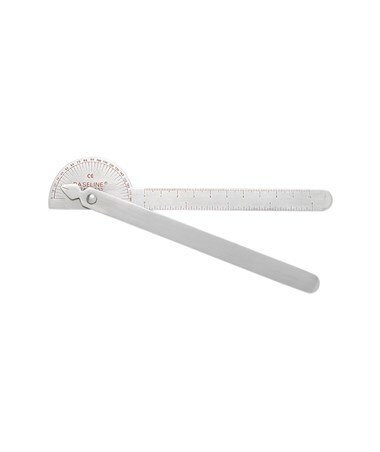 Baseline Metal Finger Goniometer - 6 inch (FEI12-1010). Baseline X-ray Radiopaque Goniometer - 180 Degree Range - 8 inch Legs (FEI12-1031). (12-1042): Baseline Metal Goniometer-180 Degree Range - 6 inch Legs - Robinson. (12-1040): Baseline Metal Goniometer-180 Degree Range - 8 inch Legs. (12-1041): Baseline Metal Goniometer-180 Degree Range - 14 inch Legs - Conzett. (12-1020)Baseline Metal Goniometer-180 Degree Range - 18 inch Legs. (12-1050): Baseline Metal Goniometer-360 Degree Range - 14 inch Legs. (12-1043): Baseline Metal Goniometer-6-piece Set. 180 Degree Range - 6 inch Legs - Robinson. 180 Degree Range - 8 inch Legs. 180 Degree Range - 14 inch Legs - Conzett. 180 Degree Range - 18 inch Legs. 360 Degree Range - 14 inch Legs.